The number is 25 and it represents the total art shows that Ricky Lowe has booked for 2017. This week the artist is traveling from Virginia Beach, where he received a 3rd place award out of 250 artists. On Friday, October 6th Ricky will arrive in the City of Richardson to set-up for the first time at Cottonwood Art Festival. Once our show wraps he will pack it up again and drive to Houston for the Bayou City Art Festival. Is Ricky Lowe new to the art world? Is the process he created and patented truly shocking? Did this artist sell his first piece only two years ago? Yes, yes, and yes. 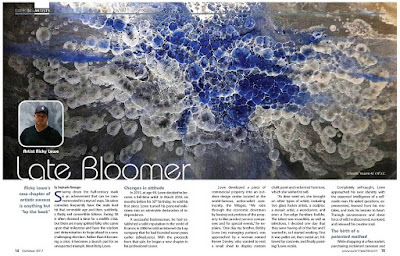 The whole story about his background and original methods are detailed in the October 2017 issue of Sunshine Artist in the featured article "Late Bloomer" on pages 14-18. Visit with Ricky in person October 7-8, 2017 at Cottonwood Art Festival in Richardson, Texas. Find out more about Ricky Lowe on his website: https://rickyloweart.com/, Facebook, or Instagram.